More GPU speculation has emerged which appears to back up a previous rumor relating to the launch timeframe of Nvidia’s next-gen graphics cards, although this nugget from the grapevine makes a worrying suggestion: that the GeForce GTX 1180 and pals will be pricey pieces of hardware to begin with. 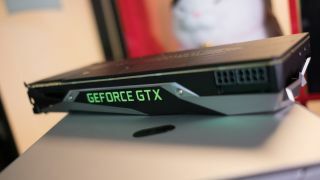 The rumor comes from DigiTimes, which cites industry sources saying that Nvidia will roll out the GTX 1180 at the end of August, with the GTX 1170 following at the end of September, and the GTX 1160 subsequently being released in October. As mentioned at the outset, this mirrors previous speculation from a YouTube denizen, although we took that with a very heavy pinch of salt, and DigiTimes isn’t always the most reliable source either. In other words, you’d be well advised to keep that salt shaker rattling liberally. Still, it’s interesting to see the initial report backed up by another source, for sure. And DigiTimes is chiming in with another angle, too – reporting that the volumes of next-gen GPUs released will depend on exactly how the stock of current graphics cards (GTX 1080 and company) is selling. We’ve been hearing a lot about the excess of current-gen GPUs which are still hanging around, after Nvidia allegedly overestimated the demand from cryptocurrency miners, which has fallen off quite considerably. That led to speculation of this being the reason why Nvidia has delayed the launch of the GTX 11-series. And, according to DigiTimes, if the launch goes ahead as planned and there are still plenty of GTX 10-series boards floating around, manufacturers won’t be willing to lower the prices of the older cards. Instead, current prices will supposedly be maintained on existing models, with the next-gen GPUs to be priced higher to “deter demand for the new cards” to some extent. In other words, when (or rather if) the GTX 1180 emerges at the end of next month, it’s going to be a costly affair, and there may be very limited quantities of this card (and the others that follow) initially. At least if all this is on the money, so to speak. Ultimately, though, this is a lot of theorizing, but it does make sense that if there is a lot of stock of GTX 1080, 1070 and 1060 cards still kicking about as their successors launch, Nvidia will have to do something on the pricing front to differentiate them.